The nuclear envelope is a highly regulated membrane barrier that separates the nucleus from the cytoplasm in eukaryotic cells. It contains a large number of different proteins that have been implicated in chromatin organization and gene regulation. Although the nuclear membrane enables complex levels of gene expression, it also poses a challenge when it comes to cell division. 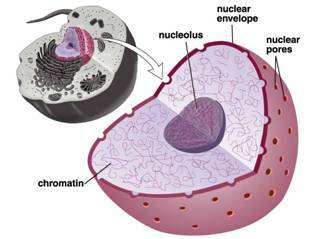 To allow access of the mitotic spindle to chromatin, the nucleus of metazoans must completely disassemble during mitosis, generating the need to re-establish the nuclear compartment at the end of each cell division. Since in Progeria farnesyl cannot be attached with a protein, called lamin A, so the nuclear envelope is altered. Farnesyl is an hydrophobic molecule that creates a link with lamin A. After this link, lamin A protein goes to the nuclear envelope in a mechanically, in order to escape from water. If there is not farnesyl enough (or even if there isn’t it at all), nuclear membrane can't be formed. The tyroid hormone increases this reaction. The conditions are a reduced statins' assumption and hypotyroidism, both connected with aging. Statins (or HMG-CoA reductase inhibitors) are a class of drugs used to lower cholesterol levels by inhibiting the enzyme HMG-CoA reductase, which plays a central role in the production of cholesterol in the liver. Increased cholesterol levels have been associated with "cardiovascular diseases"http://flipper.diff.org/app/tools/info/837, and statins are therefore used in the prevention of these diseases. Research has found that statins are most effective for treating cardiovascular disease (secondary prevention), with questionable benefit in those without previous CVD but with elevated cholesterol levels. Statins have rare but severe adverse effects, particularly muscle damage, and some doctors believe they are overprescribed. Statins inhibit conversion of HMG-CoA to mevalonate by competitive inhibition of the rate limiting enzyme HMG-CoA reductase. Herewith, statins not only inhibit the cellular production of cholesterol but also the biosynthesis of several intermediates of the mevalonate pathway (e.g. farnesylpyrophosphate and geranylgeranylpyrophosphate). These so-called isoprenoids are essential for the post-translational modification of several proteins involved in important intracellular signaling pathways (e.g. the small GTP-binding proteins Ras and Rho). Mevalonate pathway or HMG-CoA reductase pathway or mevalonate-dependent (MAD) route or isoprenoid pathway, is an important cellular metabolic pathway present in all higher eukaryotes and many bacteria. It is important for the production of dimethylallyl pyrophosphate (DMAPP) and isopentenyl pyrophosphate (IPP), which serve as the basis for the biosynthesis of molecules used in processes as diverse as terpenoid synthesis, protein prenylation, cell membrane maintenance, hormones, protein anchoring, and N-glycosylation. It is also a part of steroid biosynthesis. Hypothyroidism is a consequence of aging and produces many symptoms characteristic of it. The frequency of overt hypothyroidism, which is 5 to 8 times more common in women than men, varies from 0.1 to 2%, with an increased prevalence of up to 5% in subjects over 60 years of age. Hypothyroidism in the elderly is often atypical and lacks the classic symptoms seen in younger patients.This is due to a more insidious onset, the co-existence of several ageassociated diseases, and the notion that several signs and symptoms (fatigue, cold intolerance, constipation, congestive heart failure, depression, etc) may be attributed to the process of aging itself. The most frequent cause is autoimmune thyroiditis, followed by prior therapy for previous thyrotoxicosis. Protein farnesylation, catalyzed by protein farnesyltransferase, plays important roles in the membrane association and protein-protein interaction of a number of eukaryotic proteins. Recent development of farnesyltransferase inhibitors (FTIs) has led to further insight into the biological significance of farnesylation in cancer cells. A number of reports point to the dramatic effects FTIs exert on cancer cells. In addition to inhibiting anchorage-independent growth, FTIs cause changes in the cell cycle either at the G1/S or at the G2/M phase. Furthermore, induction of apoptosis by FTIs has been reported. FTIs also affects the actin cytoskeleton and cell morphology. Studies of laminopathies have provided insights into novel functions of the nuclear envelope. Perhaps most significantly, these studies strongly suggest that the intermediate filament nuclear lamina, although serving as a structural support for the nuclear membranes, must have additional functions. Because very different disease phenotypes can result from alterations in lamins, the nuclear lamina likely has cell-type and tissue-selective properties. Changes in gene activity are part of the cellular aging process, however, the mechanisms that cause age-related alterations in gene expression are poorly understood. NPCs, essential multiprotein channels that mediate molecular trafficking between the nucleoplasm and cytoplasm of eukaryotic cells, are extremely long-lived in post-mitotic tissue and deteriorate over time causing a loss of cell compartmentalization in post-mitotic neurons. This fact suggest that nuclear pore deterioration might be a general aging mechanism leading to age-related defects in nuclear function, such as the loss of youthful gene expression programs. Age-dependent deterioration of nuclear pore complex function and the associated failure of the nuclear permeability barrier is characterized by the leaking of cytoplasmic proteins into the nucleoplasm. It detected large filaments inside the 'leaky' nuclei of old mouse and rat neurons, which stained with the cytoplasmic protein tubulin. Strikingly, tubulin-positive intranuclear structures have been linked to various neurological disorders including Parkinson's disease. Thus, nuclear pore deterioration might initiate or contribute to the onset of certain neurodegenerative diseases. Because of the association between aberrant nuclear structure and tumour grade, nuclear morphology is an indispensible criterion in the current pathological assessment of cancer. Components of the nuclear envelope environment have central roles in many aspects of cell function that affect tumour development and progression. As the roles of the nuclear envelope components, including nuclear pore complexes and nuclear lamina, are being deciphered in molecular detail there are opportunities to harness this knowledge for cancer therapeutics and biomarker development. The nuclear envelope (NE) becomes transiently ruptured and repaired during interphase in various human cancer cells. This partial breakdown nuclear barrier is associated with the temporary loss of nuclear integrity and the entrapment of cytoplasmic organelles in the nucleus. The NE is a double membrane that regulates all nuclear trafficking of RNAs and proteins and prevents the passive diffusion of molecules larger than ~40 kDa between the nucleoplasm and the cytoplasm. Using fluorescent protein reporters in conjunction with time-lapse microscopy to monitor the integrity of the nuclear compartment in various cancer cell lines, we observed bursts of NE rupturing events, each followed by NE repair, during interphase in a subset of cells. Not only did cells survive these crises, they continued to proliferate. Strikingly, NE rupturing was associated with the formation of micronuclei, the mislocalization of nucleoplasmic proteins and, in the most extreme cases, the entrapment of mitochondria in the nuclear interior. The frequency of these NE rupturing events was higher in cells in which the nuclear lamina, a network of intermediate filaments providing mechanical support to the NE, was not properly formed. Our data uncover the existence of a NE instability that might induce random mutations including chromosome rearrangements and thereby promote tumor formation. In summary, NE rupturing might dramatically change the genomic landscape of cancer cells and thus accelerate the rate at which evolving premalignant cells can acquire favorable genotypes instrumental for tumor progression. As such, NE instability might be a cancer-enabling feature relevant for cancer diagnostics and intervention.